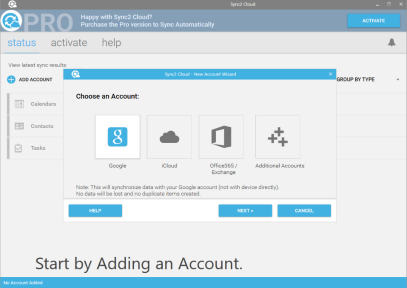 With Free Sync2 Cloud synchronization software you can synchronize Contacts and Calendar between Hotmail, Outlook.com, Live.com and Microsoft Outlook 2007, 2010, 2013, 2016. 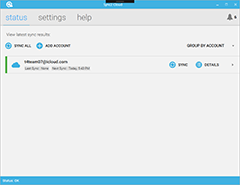 Add Hotmail and Outlook.com accounts to Microsoft Outlook 2007, 2010, 2013, 2016 and you will be able to add and edit Calendar events and Contacts in Outlook or in Outlook.com/Hotmail. Have your Outlook Calendar and Contacts in Hotmail and Outlook.com. Click “Finish” and synchronization begins. Repeat steps 3-6 to add Calendars from other Hotmail, Outlook.com or Live.com accounts, if you want to sync Outlook with multiple Hotmail or Outlook.com accounts. In a few moments your Hotmail and Outlook.com will be synchronized with Microsoft Outlook.